Our lab is focused on understanding the metabolism and physiology of bacteria, specifically how they sense their environment and obtain energy. 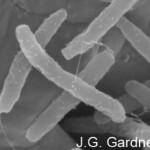 We use the soil bacterium Cellvibrio japonicus to study how microbes detect and degrade recalcitrant polysaccharides, such as those found in plant cell walls and the shells of insects and crustaceans. Our lab uses an interdisciplinary systems approach combining transcriptomics, bacterial genetics, and biochemistry. By uncovering the mechanisms of polysaccharide degradation by bacteria we hope to: (1) Determine how bacteria are able to sense insoluble polysaccharides as nutrients, (2) Understand how the degradation of polysaccharides is regulated, (3) Elucidate unknown gene function in the context of polysaccharide degradation, and (4) Engineer useful properties into bacteria that may have industrial applications.